There's some unsurprising overlap between Transformers names and Marvel Comics superhero names. For the first seven years, Transformers toys were named BY Marvel. (Bob Budiansky in specific.) It's why Transformers have super-hero-y names to begin with, setting aside the weird Latin folks like Optimus Prime or Omega Supreme. It wasn't until Transformers left Marvel that we got guys named stuff like, uh, Cheetor and Waspinator and Rhinox. So, uh, yeah. But in the grand tradition of Marvel superhero comics-y names, there were Transformers named things like, say, "Venom." And, no, the Spider-Man villain didn't exist yet at the time -- he'd be a few years later than the Deluxe Insecticon, but Venom was also the name of a Black Panther villain. And there's "Ravage," who's also an Incredible Hulk villain. When you have to name 20 Transformers in a day, you might start having to pull from the archives. Transformers Firestar was just a character in a single Transformers cartoon episode about lady Autobots, who'd appear just this once and never be seen again. Obviously the Marvel Superhero Firestar who shared a starring roll on a cartoon show with her Amazing Friends one year earlier would have both the clout and the seniority. But it meant that, well, a toy of Transformers Firestar would always have some complications. When BotCon tried to make a toy of her in 2005, rather than rename her, they decided to instead make a Firestar look-alike who served as her protege. Her name was Flare Up. And Flare Up went on to do some things in lieu of Firestar for a while. Flare Up got to show up in Transformers Animated, for example, in a form obviously based on her BotCon toy rather than the original Firestar's design. And ten years later, BotCon would give Flare Up a second toy. For a while, it seemed Flare Up might just up and replace Firestar in general. But here we are, three more years later, and we have Novastar. A rename attempt, even though a Firestar appeared in IDW comics not long prior. (You don't have to abide by toy trademark rules in comics, especially not in interiors, especially especially if you don't claim trademark rights.) An actual toy of the original Firestar character, for the first time ever, just with a name that sidesteps the trademark issue. 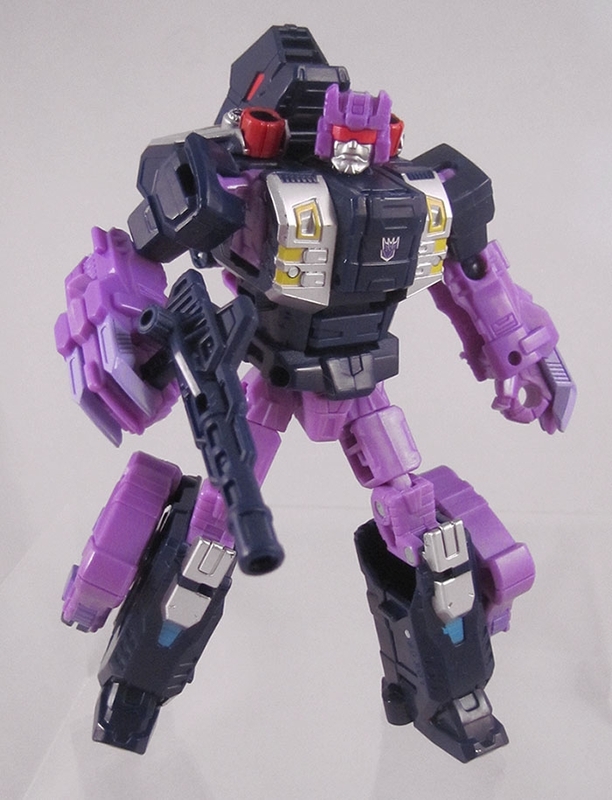 The toy itself is Moonracer with a new head, new gun, and new deco. It tries to do some different things with its deco that sets itself apart from how Moonracer's presents itself -- there's less translucent plastic visible in vehicle mode, for example. And all of the original Female Autobots were shaped pretty same-ily that this toy can mostly get away with being Moonracer's body with a Firestar head. It passes the squint test. I liked Moonracer's toy, despite it being pretty backpack heavy, and that means I like Novastar's, too. I do regret that her plastic color breakdowns mean she can't have her pale yellow hands. Her hands and thighs are tied to the same plastic tree, and that tree is the unpaintable nylon tree, so they either both have to be orange or they both have to be pale yellow. Orange is probably the better choice. The vehicle gives her a pale yellow stripe down the side, which helps. 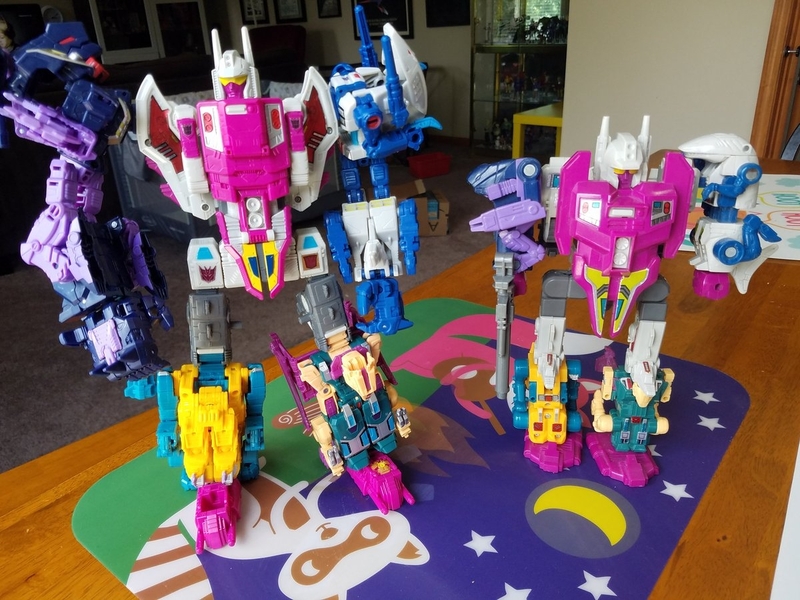 She's the only toy in wave 4, and (short wave 3 Optimal Optimus actually showing up in North American stores) the last major retail Power of the Primes toy release. Novastar comes two per case, so at least she isn't shortpacked. I was worried about that. But I see lots of reports for her across the United States (only at Walmarts so far) so hopefully she won't be too hard to find in general. 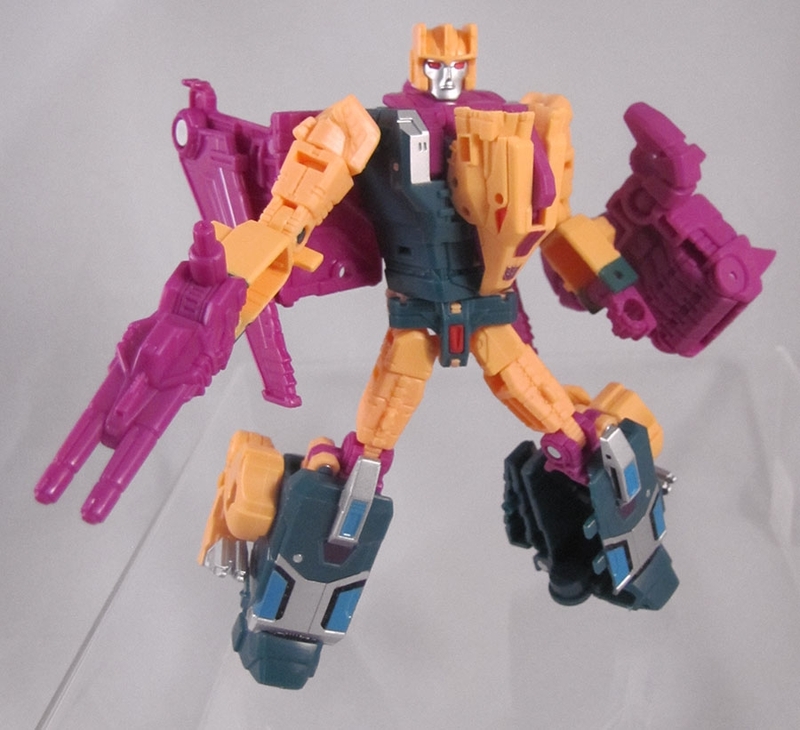 Now if only they made toys of Greenlight and Lancer to be Elita Infin1te's legs. Not holding my breath on that. Hey, look! Slash got a retool! 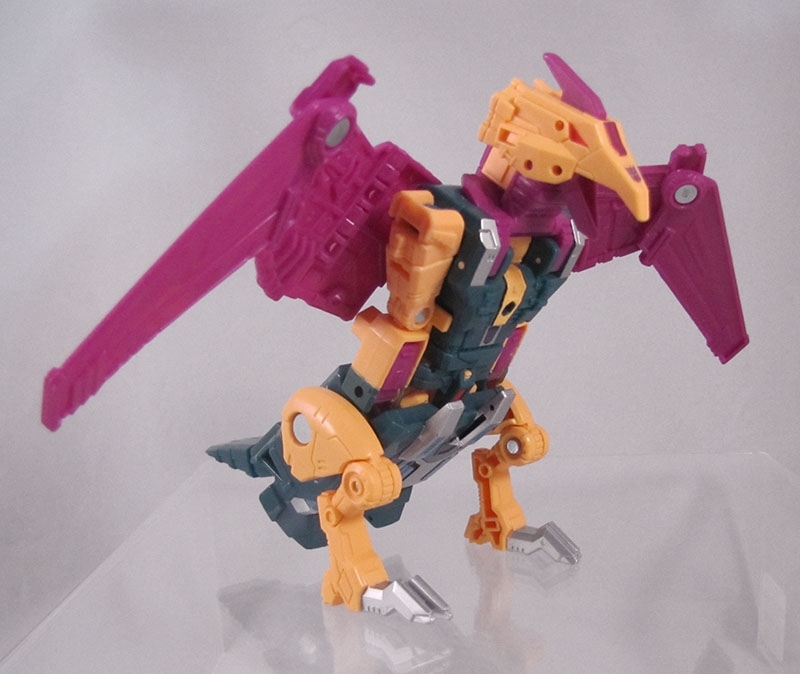 The lady Dinobot got a new head and is now the 1988 Firecon character Cindersaur! Okay, first of all, Slash is a great toy. So Cindersaur is still a great toy. So, like, that's still a recommend. The new head doesn't alter the transformation at all, and though the new colors are a little monotonous in raptor mode (without the robot mode's green face and touches of gray), it's still a vibrant-looking thing. So thumbs up just based on that. But there's more! All of the Power of the Primes toys come packed randomly with one of 12 different cards that give a different Prime-based power. Ten of these cards are irrelevant to the rest of this paragraph, but of the final two, one uses male pronouns and the other uses female pronouns. (the female card was discovered before the male card, and for that day and a half or so, the toy was known affectionately as "Cindysaur") Maybe someone got their wires crossed and accidentally used Slash's pronouns on one of the cards, but the new Cindersaur head is sculpted the way Hasbro tends to sculpt their women characters: there's lips and a smile and some softened features. Or, we could just take the text as given and determine that Cindersaur is genderfluid. They're male sometimes, female sometimes, and, heck, maybe it changes depending on which Prime Master is plugged in. That's my take-away, anyway. Look... *throws the pack-in cards down on the table* ... it's canon. 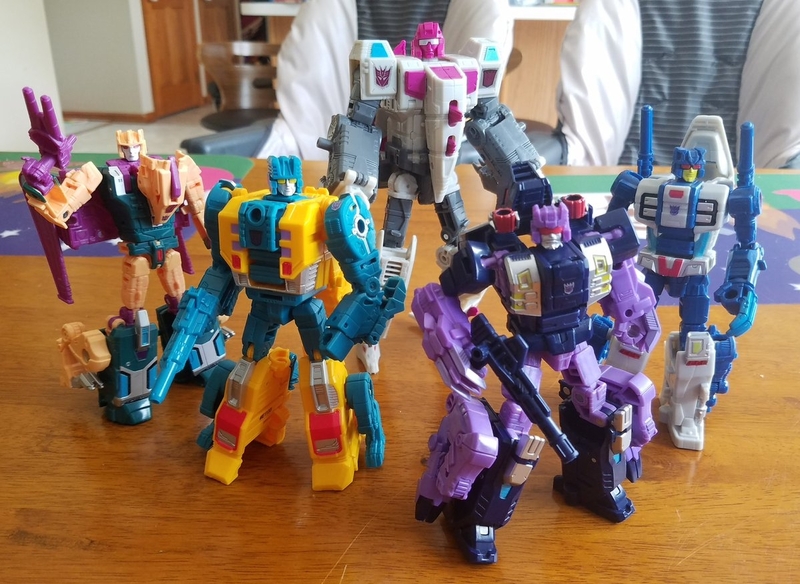 The two best combiner teams from Generation One were the Protectobots and the Terrorcons. This has absolutely nothing to do with which two teams I owned as a child. But do you know why the Terrorcons were the best? Because they were effin' monsters. Vehicles are essentially little boxes, but a monster has arms, legs, teeth... all these extra things to play with. 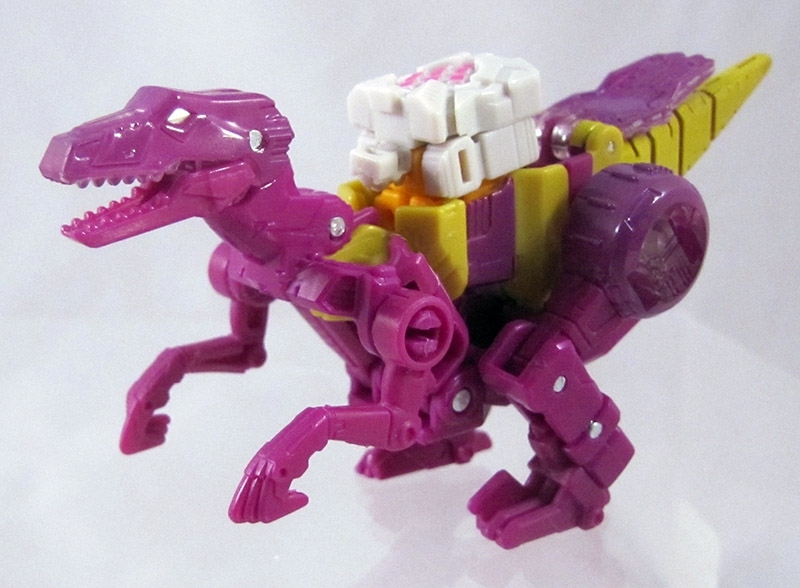 Terrorcons, then, transform into two separate things you can do things with (besides scoot along on the floor). So, yeah. They're empirically the best. And now there's a new combining version of them! I've talked about Hun-Gurrr, the torso before, and I got Rippersnapper a few months ago, but since then I've gotten his other three limbs. I'll say right off the bat what makes these toys improvements over the originals: they have working jaws. Other than Blot, they all have working jaws. It's by far the best improvement of the entire set. Like, sure, the articulation is way up all around, but frankly jaws are the most important. Cutthroat is the weakest of the limbs. Engineering-wise, he's large amounts of the Dinobot Swoop repurposed. He's got the same thighs, arms, and he mostly transforms the same. The only difference is how the beast mode feet get tucked away. But his beast mode head is hinged pretty loosely, and so it likes to fall off. The beast mode torso doesn't hide very well that it's just a compacted robot mode, and so it looks elongated and goofy. Blot, other than his lack of chompers, is by far the best, though! 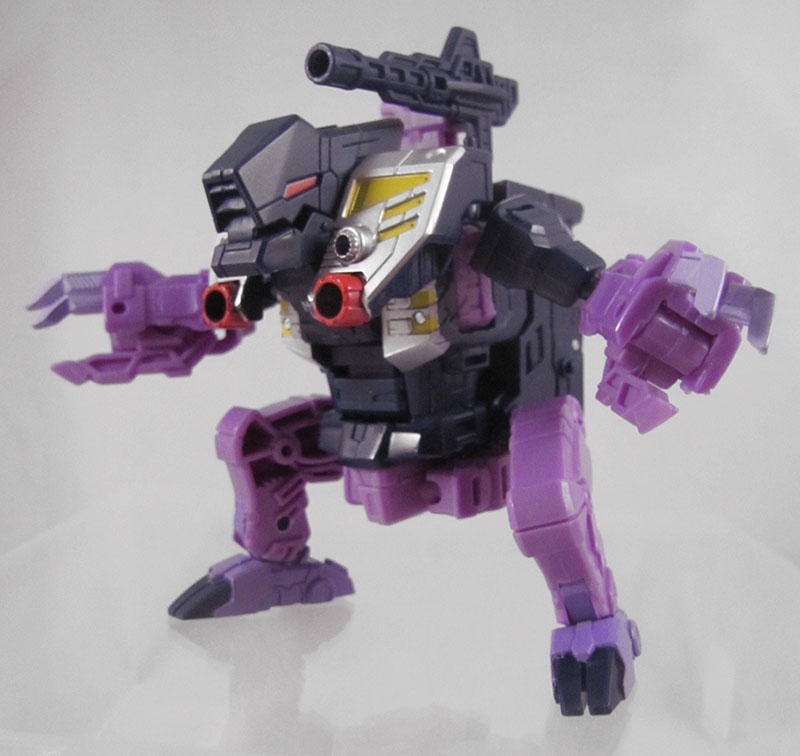 He wads up his robot mode legs behind him in beast mode to create a different shape entirely, resulting in this angry grumpy cube. 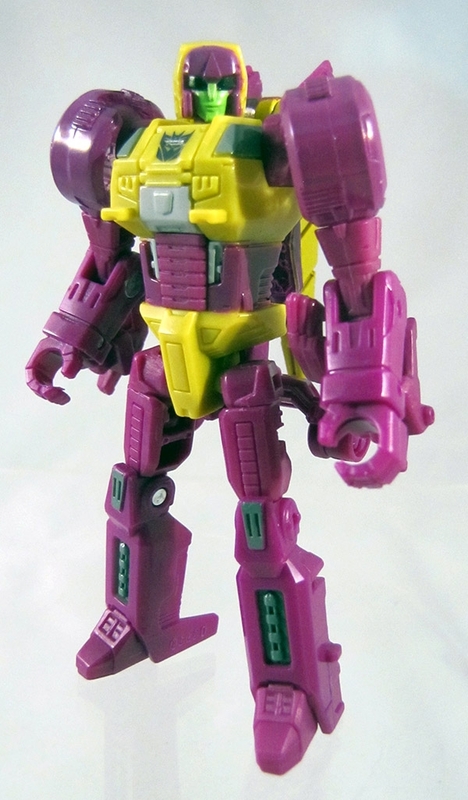 I dub him "Most Improved" of the new Terrorcons, since he's just better in all respects. He doesn't just stand up and hide his monster arms behind him. The monster torso/head folds back, giving him a different robot mode chest, and the fists cleverly transform out of the beast claws. Sinnertwin has more articulation than the original. That's what I got to say about him! I mean, that extra articulation is nice, with the jaws and the balljointed beast mode necks (at the skull -- it's just hinges at the torso), so there is a lot more to do with him. 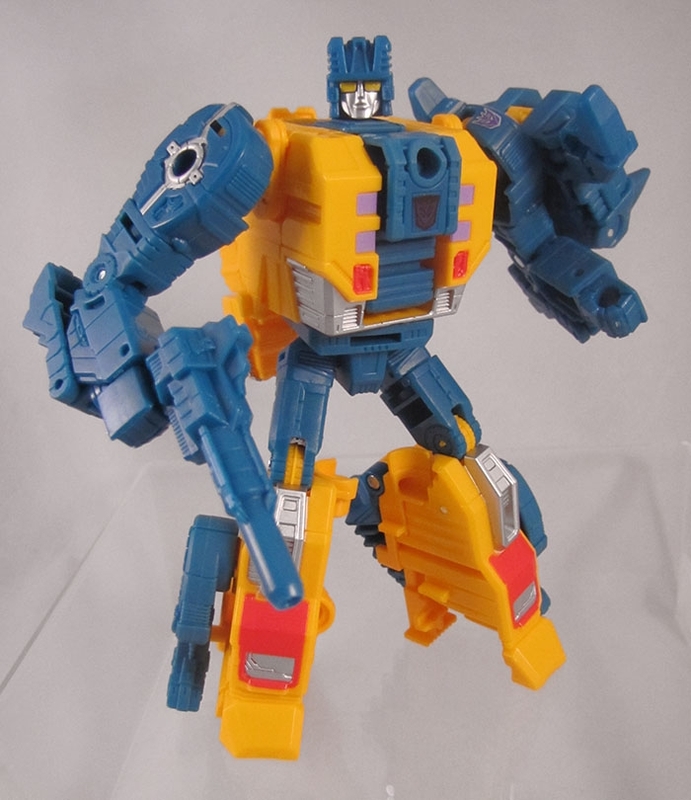 But he's had less evolution to his design than Blot. Hun-Gurrr holds together extremely well in torso mode. A friggin' lot of tabs. Tabs everywhere. That results in a very solid combiner robot. I can't find fault with their combined mode, Abominus. 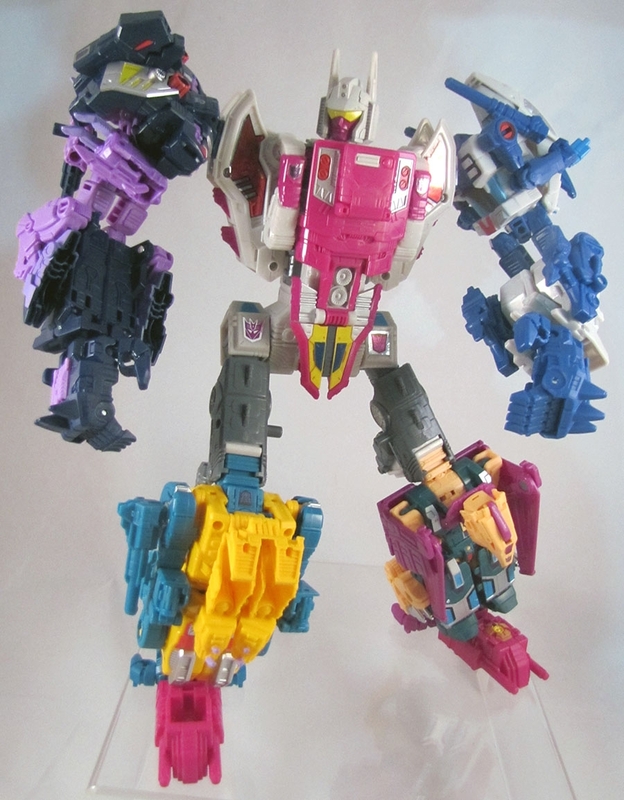 He may be the best of the new Combiner Wars-style guys. And he's made out of monsters, yo. 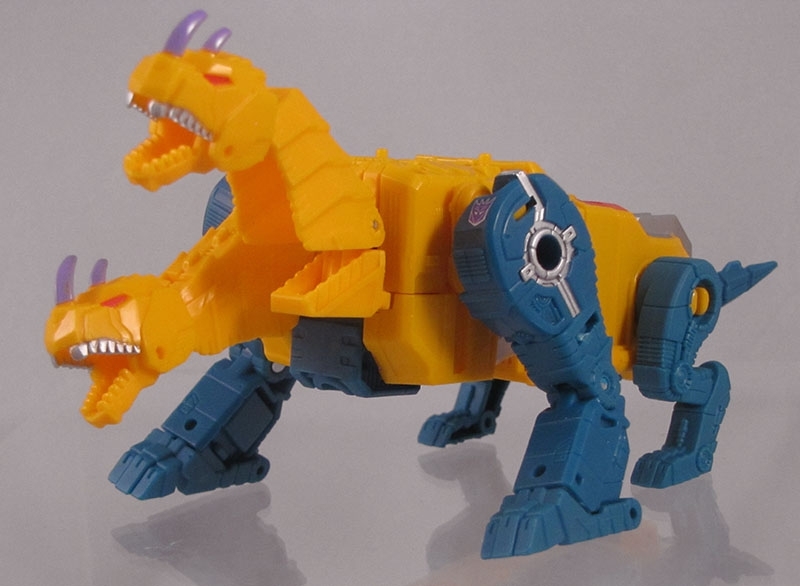 Finally, the Dinobot combiner that "The Beast" sort-of kind-of not-really foretold! Wave 2 Power of the Primes has two the final two Dinobots, allowing Volcanicus to be properly combined. Sludge owes a lot of his parts to Slag. In robot mode, his thighs, shins, and upper arms are the same. From the waist up, he transforms backwardsly, with his front becoming the dinosaur back instead of the dinosaur stomach. Similarly to Slag, Sludge's brontosaurus head/neck closes around the robot head, concealing it. The original Sludge toy had you fold his forearms up against the insides of his upper arms, with his brontosaurus toes at the elbows. This new toy just leaves this transformation step out of the equation and leaves the brontosaurus toes at the wrists. The instructions want you to bend his arms at the elbows for dinosaur mode, but I think I like them better straight. It's more of a brachiosaurus look, but oh wells. Snarl, the stegosaurus, is all new! He keeps his thagomizer behind his head, but he otherwise transforms similarly (surprise!) to his other quadropedal Dinobot friends. His head's a little smaller than the others, possibly since it needs to hide inside the combiner port cavity within his own chest, rather than inside a dinosaur part. Instead of being flatfooted like the others, his dinosaur hind legs stand on their tippy toes. Sludge, Snarl, Grimlock, Swoop, and Slag all combine to form VOLCANICUS! Volcanicus is actually a pretty good combiner. A lot of anguish has been thrown about over how wide his shoulders are, but so long as you plug those extra two combiner fists into his abs, it's really not a problem in person. He's wide, sure, but his torso tapers from the waist properly to make it look fine. His wideness merely makes him look mighty. The other option for the two extra fists is to plug them into the back of the feet for additional stability. He's not going to need this. Well, he's not if yours has the same plastic tolerances as mine. The biggest threat to my Volcanicus's stability is that one of his feet likes to rotate a little to the right, which can lead to him ultimately losing traction and doing the splits. Extra heels would not solve this. Tighter 5mm pegs at the ankle, yes, but not heels. The major negative to Volcanicus is his lack of a weapon. In the cellphone game Earth Wars, Volcanicus gets an upsized version of Grimlock's Fall of Cybertron sword. You can try giving him the FoC toy's sword, but it was already a little undersized for the Voyager Class toy. Being held by a giant combiner makes the sword look like it's meant to serve cheese on a plate. There's some third party options, one of which is $50 and includes a bunch of extra stuff I'm absolutely not interested in, and at least one Shapeways sword. For the time being, at least, my Volcanicus is gonna have to fight people with his bare fists.